If you have noticed signs of deterioration and foundation failure in your commercial building in the Dover, DE area, don’t hesitate to call the foundation repair experts at Matthews Wall Anchor. Foundation failure can be the result of many exterior forces including expanding and contracting soil, burst or broken pipes, and severe weather conditions. No matter the reason, foundation failure can destroy your commercial property. We know the Dover area and our foundation repair structural contractors can take the proper steps to ensure your foundation will be strong, stable, and supportive for many years. We provide the best foundation services in the area and work efficiently to get your property back in the safety zone. You can have confidence in Matthews Wall Anchor, we install only the best commercial products from Earth Contact Products (ECP). 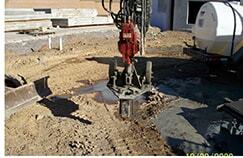 ECP is the leading manufacturer of the foundation repair industry. Our products include helical piles, augercast piles, steel piers, and soil nailing. These products are designed to support, strengthen and stabilize weak foundation walls. If you have questions or concerns, our courteous and knowledgeable staff can assist you. We provide free quotes for every project, so you’ll know what to expect before the starting the project. We have repaired foundations and retaining walls for many businesses in the Dover, Delaware area and have a great reputation for quality foundation repair work. Contact us today!